Now that the first half of 2013 is over, here’s an update on the search-engine market in China: Google is now at fifth place and only has 2.13 percent of the traffic share in terms of page views, while Chinese search giant Baidu has also been been on a steady decline with less than 70 percent of the share now. 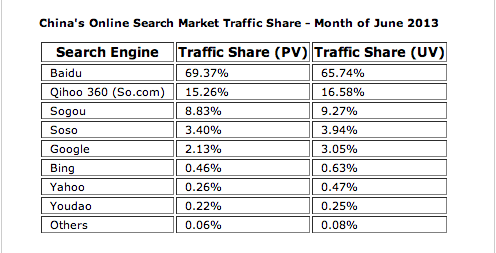 According to data from CNZZ (via Tech in Asia), Google has been shedding its search market share in China steadily. It slid from fourth place to fifth place in March, and its traffic share in terms of page-views for June has declined by nearly a full percentage point from the same month a year ago. At the same time, Baidu is also coming under intense rivalry from other players in the search market, particularly new entrant Qihoo, which launched its search engine in August last year and quickly jumped into second place. Back in November, CEO Zhou Yongyi set his sights on a 15 to 20 percent share of the market, enough to “destroy” Baidu’s monopoly. In June, it crossed the 15 percent mark. Currently, Qihoo’s search engine occupies 15.26 percent of traffic share in terms of page-views, tipping Baidu off its pedestal as the latter has fallen below 70 percent — with 69.37 percent of the share. Earlier this year, Qihoo’s Zhou expressed his ambition for the company’s search engine to reach 20 percent market share by the end of this year, and it seems to be on track to do so. Sohu’s Sogou and Tencent’s Soso occupy third and fourth place respectively, with Sogou taking 8.83 percent of the traffic share and Soso having 3.4 percent. Google’s steady decline does not come as much of a surprise since it left the Chinese search market in 2010. However, Baidu – once a monopoly in the market with an 80 percent share – has been experiencing a rather surprising change in fortune as Qihoo’s entrance has posed one of the first credible threats to Baidu’s position. Despite focusing on mobile and revealing that it hit 100 million daily active users on its mobile search product in Q1 2013, Baidu’s earnings fell short of analyst expectations with $961 million in revenue and adjusted earnings per share of $1.00. It is expected that competition between Qihoo and Baidu will be fierce, and the coming Chinese search war will be waged on the mobile front.